Dimensions 0.50 by 7.25 by 9.50 in. A charismatic young English chef offers a refreshingly simple approach to food preparation in a cookbook featuring more than 120 delicious recipes that combine bold flavor with fresh ingredients and a 'stripped to the essentials' style. Reprint. 50,000 first printing. Amazon.com description: Product Description: Stop making reservations, and start cooking dinner! Jamie Oliver introduces us to his concept of -naked+ food, and shares his simple, feisty, and delicious recipes that combine bold flavors with fresh ingredients. Oliver+s cookbooks appeal to anyone who wants to prepare fantastic meals but doesn+t want to spend all night cooking.The Naked Chef, filled with more than 120 fuss-free recipes and with full-color photographs throughout, proves that even kitchen novices can make perfect foolproof roast chicken, homemade ravioli, five-star risotto, and a chocofreak+s dream chocolate tart. 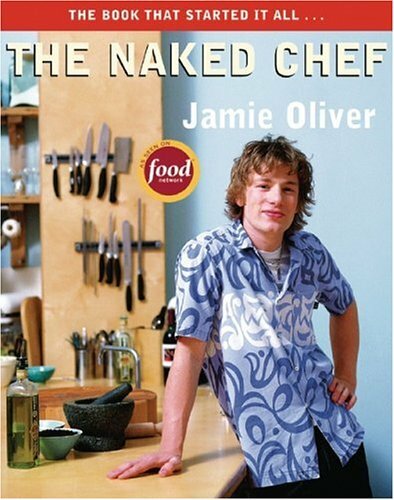 The Naked Chef is an international bestseller, and has sold more than 200,000 copies in hardcover in the U.S.